Intrigued by the beauty and versatility of the dahlia, I started growing several varieties of this resilient flower in my Portland backyard in 2006. Today, I offer more 200 varieties of dahlias that, until recently, Portlanders could buy right from my front doorstep. 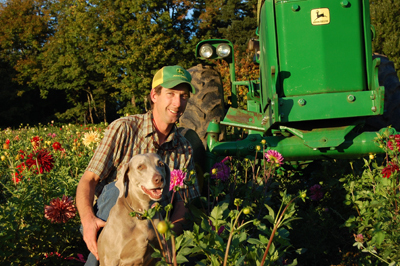 However, when the demand for dahlias became too great to accomodate from withinside the city limits, I moved the farm to 14 acres in Tillamook, OR. If you live near the coast, stop on by. Or make a day trip to our annual Dahlia Fest August 31 September 1-7-8, where you can stop by and talk to me about growing dahlias and their uses (try thinly sliced raw tubers on salads! ), see the varieties in bloom and place orders for the following growing season. You can also pick up fresh cut flowers from July15 till end of November at several stores around Portland or give me a call if you have something special in mind (503-771-1199). I will be at Old House Dahlias August 10th through frost on Saturdays and Sundays. To receive e-mail updates from Old House Dahlias, fill out the from on the Contact page.